Mycotoxins are toxic secondary metabolites, representing a wide diversity of chemical species, which are produced by certain toxigenic molds during their development on foods and feeds. The molds which appear to be the main producers of mycotoxins belong to the Aspergillus, Fusarium and Penicillium genera. Mycotoxin contamination, particularly aflatoxin, is commonly found in locally produced agricultural crops such as corn, peanuts, coconuts and cassava and their food and feed products. The consumption of a contaminated feed by a domestic animal results in the contamination of foods such as meat, milk and other dairy products. These toxins elicit both acute and chronic toxicities. Some mycotoxins are acutely toxic to the liver, while others damage the kidney, the central nervous system or the circulatory system. The aflatoxins are produced by two molds, Aspergillus flavus and A. parasiticus. Its specific forms are designated as B1, B2 , G1 , G2 , M1 & , M2. Aflatoxin B1 is the most potent naturally occurring carcinogen known. Aflatoxin M1 is a toxic metabolite, derived from Aflatoxin B1 which occurs in milk when aflatoxin-contaminated feed is consumed by dairy cattle. B designations of Aflatoxin B1 & B2 resulted from the manifestation of blue fluorescence under UV light and the G designations refer to the yellow-green fluorescence of the aflatoxin group. In the Philippines, the growth of the aflatoxin-producing fungi is favored by climatic conditions, i.e., high temperature coupled with high relative humidity (80-90% wet season and 50-70% dry season). Aflatoxin contamination in agricultural crops, food and feed commodities is a serious problem in the country. Coconut products and by-products are considered to be the Philippines’ most important agricultural commodity in the international and local market. Almost every available region especially in the rural areas engages in coconut production. Coconut farmers depend on them for their livelihood. The white meat from the coconut is dried directly or indirectly by various methods like sun-drying, tapahan or kukum method. High moisture copra can easily be contaminated with aflatoxin. Aflatoxin are known to be human carcinogens based on sufficient evidence of carcinogenocity in humans (IARC 1987, 1993). Aflatoxicoses is a poisoning resulting from ingestion of aflatoxin-contaminated food in feed. A case-control study in the Philippines, where mean aflatoxin contamination levels in dietary items were established and individual levels of aflatoxin consumption were determined retrospectively, demonstrated an increased, dose-related risk of developing hepatocellular cancer in persons with higher ingestion of aflatoxin. Aflatoxins, especially B1, have been tested extensively for genetoxicity. It induces DNA damage, gene mutation, chromosomal anomalies and cell transformation in mammalian cells in vitro. Aflatoxins are genetoxic carcinogens. For this type of carcinogen, it is generally felt that there is no threshold dose below which no tumor formation would occur. In other words, only a zero level of exposure will result in no risk. Aflatoxin M1 is a metabolic hydroxylation product of B1. Aflatoxin M1 produced DNA damage in rodent cells in vitro and gene mutation in bacteria. With respect to the carcinogenicity of aflatoxin M1, International Agency for Research on Cancer (IARC, 1993) concluded that there is inadequate evidence in humans but sufficient evidence in experimental animals (liver tumor). The overall evaluation (IARC) was “Aflatoxin M1 is possible carcinogenic to humans. Mixtures of aflatoxins and aflatoxin B1 were tested extensively for its carcinogenicity in experimental animals like mice, rats, hamsters, fishes, ducks and monkeys. Oral administration of mixtures of aflatoxins and aflatoxin B1 caused hepatocellular and or cholangiocellular liver tumors, including carcinomas in all species tested except mice. In mice, aflatoxin administered increase the incidence of lung adenomas. In 1979, a study on the toxic effects of aflatoxin to rats were tested (Norted). Finely ground corn mixed with aflatoxin were given to rats by stomach tube. The rats received high toxic doses (10 or 20 mg aflatoxin/kg body weight). Signs of typical aflatoxicoses were observed. A feeding trial was done by Marin, et al (2002) to determine the effect of aflatoxin-contaminated diets on growth and hematological and immunological parameters. Low doses of aflatoxin (140 and 280 ppb) were included in a corn-soybean diet of weanling piglets for a period of four (4) weeks. The result showed that there was depressed growth as well as alteration on the humoral and cellular immunity aspects in pigs. A study of the carcinogenicity of dietary aflatoxin M1 in male Fischer rats compared to aflatoxin B1 was done by Cullen, et al. Aflatoxin M1 and aflatoxin B1 (0.0 to 50 ug/kg) were fed to male Fischer rats starting at seven (7) weeks to 21 months of age. Hepatocellular carcinomas were detected in 2 of 37 rats and neoplastic nodules were found in six of 37 rats fed with 50 ug/kg afla M1 between 19 and 24 months. Nineteen(19) of 20 rats fed a diet containing 50ug/kg of afla B1 developed hepatocellular carcinomas by 19 months of age. The results indicated that aflatoxin M1 is an hepatic carcinogen although it is considerably less potent that aflatoxin B1. Research was done evaluating the excretion of aflatoxin B1 on eggs of laying Japanese quails (Oliveira, et al). The quails were fed with prepared rations containing 0, 25, 50 or 100 ug Aflatoxin B1 /kg feed for 90 days. The results showed that the average egg production was not affected. However, the egg weight was significantly lowered. Residues of aflatoxin B1 were detected in eggs at levels that ranged from 0.01 to 0.08 ug/kg . In swine, the effects of feeding aflatoxin-contaminated corn depend on the age of the pig and concentration of the toxin in the feed. Low levels (20 to 200ppb) can affect the feed intake of the pig and suppression of the immune system. High levels (1000 to 5000 ppb) result in death. There is sufficient evidence in humans for the carcinogenicity of naturally occurring mixtures of aflatoxins and aflatoxin B1. However, there is inadequate evidence of the carcinogenicity of aflatoxin M1 in humans but may possibly be carcinogenic to humans. The United States Food and Drug Administration (USFDA) enforces the following action levels for aflatoxins present in human food, animal feed and animal feed ingredients. In India, tolerance limit of 30 ppb aflatoxin in all foods has been fixed. Brazil adopted the maximum allowed levels of 20 ppb for corn. The incidence of aflatoxin in coconut and its by-products was first presented as a problem when the USFDA discovered and isolated aflatoxin from copra and copra meal sometime in 1970. In effect, the USFDA set a tolerance limit of 20 parts per billion (ppb) of aflatoxin for coconut products beyond which the use of any contaminated commodity for edible use was banned. Due to the stringent regulations on aflatoxin level imposed by the European market, the Philippine Coconut Authority set up an aflatoxin laboratory for the purpose of monitoring aflatoxin in copra and its by-products. 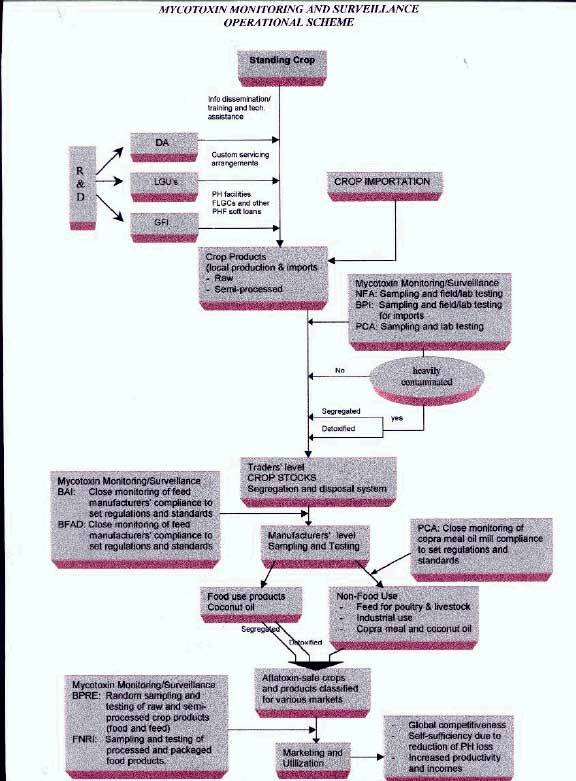 In 1990-1992, the RP-UK Aflatoxin Project in Copra was conducted in coordination with the PCA and Natural Resources Institute (NRI) of the United Kingdom. Monitoring and surveillance studies be continued in all aflatoxin-susceptible agricultural crops and their food and feed products and the data obtained will served as basis for setting the aflatoxin regulatory limits in the country. Massive or intensive campaign on the effects of mycotoxins, particularly aflatoxins in radios, televisions to educate the people. BFAD should continue testing market products to ensure the safety of the foods for human consumption as well as to safeguard the health of the consumers. 2. Coker, R.D., Jones,B.D., Nagler, M.J., et al. Mycotoxin Training Manual. Tropical Development Research Institute, October 1984. 3. Cullen, Joan M., et al. Carcinogenicity of Dietary Aflatoxin M1 in Male Fischer Rats Compared to Aflatoxin B1. 4. Directive 2002/32/EEC of the European Parliament and of the Council of 7 May 2002 on undesirable substances in animal feed. Official Journal of the European Communities. OJL 140/10.30.5.2002. 5. IARC. International Agency for Research on Cancer. IARC Monographs on the Evaluation of Carcinogenic Risks to Humans. Overall Evaluations of Carcinogenicity. Supplement 7. Lyon, France: IARC, 1987. 6. IARC. International Agency for Research on Caner. IARC Monographs on the Evaluation of Carcinogenic Risks to Humans. Some Naturally Occurring Substances: Food Items and Constituents, Heterocyclic Aromatic Amines, and Mycotoxins. Vol. 56. Lyon. France: IARC, 1993. 7. Marin, D.E., Taranu, I., Bunaciu, R.P. Pascale, D.S. 2002. Changes in performance, blood parameters, humoral and cellular immune responses in weanling piglets exposed to low doses of aflatoxin. Journ. Animal Sci. 80(5):1250-1257. 8. Norted, W.P., 1979. Effect of ammoniation on the toxicity of corn artificially contaminated with aflatoxin B1, Trop. Sci. 25:139-154. 10. Oliveira, C.A., Kobashigawa, E., Reis, T., Mestieri, L. 2000. Aflatoxin B1 residues in eggs of laying hens fed a diet containing different levels of the mycotoxin. Food Additives and Contaminants 17(6):459-462. 11. RP-UK Reduction in Aflatoxin Contamination of Copra in the Philippines. Jan. 1990 to June 1992. Vols. 1-3, NRI. 13. Safety Evaluation of Certain Mycotoxins in Food. WHO Food Additives Series:47, 2001. 14. United States Food and Drugs Administration. FDA Regulatory Guidance for Toxins and Contaminants.